I try to remember to look up the ingredients for the Improv Challenge as far in advance as possible so I can come up with the perfect recipe to share with everyone on the reveal day. The ingredients for this month are cake and frosting. Which really threw me for a loop. What in the world can you make with cake and frosting other than a cake and frosting? While I pondered this, I happened to mention it aloud to Tom who said “Grandma’s Gobs”. I asked him how that was going to meet the ingredient challenge and he told me that Grandma makes her gobs with boxed cake mix and then creates an icing (frosting) to put between them. Not coming up with any better ideas, I immediately decided that Grandma’s Gobs were the way to go for this challenge. If you’re not from PA, you might not have a clue of what I’m talking about. 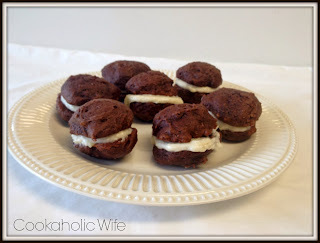 Gobs are also whoopie pies or cookie sandwiches. Now that we’ve got that out of the way, lets get onto the recipe, shall we? 1. Preheat the oven to 350. Line two baking sheets with parchment paper. 2. In a large bowl, whisk together the dry cake mix, water, oil and eggs. Then whisk the flour into the mixture. It should still be moist but not runny. 3. Drop rounded tablespoons onto the prepared baking sheets and bake for 10-12 minutes. Transfer to wire racks to let cool completely. 4. Meanwhile, combine milk and flour in a small saucepan and heat over medium-low heat. Whisk constantly until the mixture forms a thick paste. Remove from the heat and set aside to let cool. 5. In the bowl of your stand mixer, beat together the margarine, sugar and shortening until fluffy. Add in the cooled paste and the vanilla and beat on medium speed until fully combined. 6. Match up evenly sized cookies. Use a flat spatula to spread a dollop of the icing on one cookie and top with the other. Repeat until all cookies are paired up with icing. Having nothing to base the taste on, I had Tom try these and he said I made them exactly as his grandmother did. Apparently these are quite the family favorite as his brother is planning to stop by and take home some of them. "Gobs" must be short for "GOBBLED UP!" That plate would not last 2 minutes in this house! 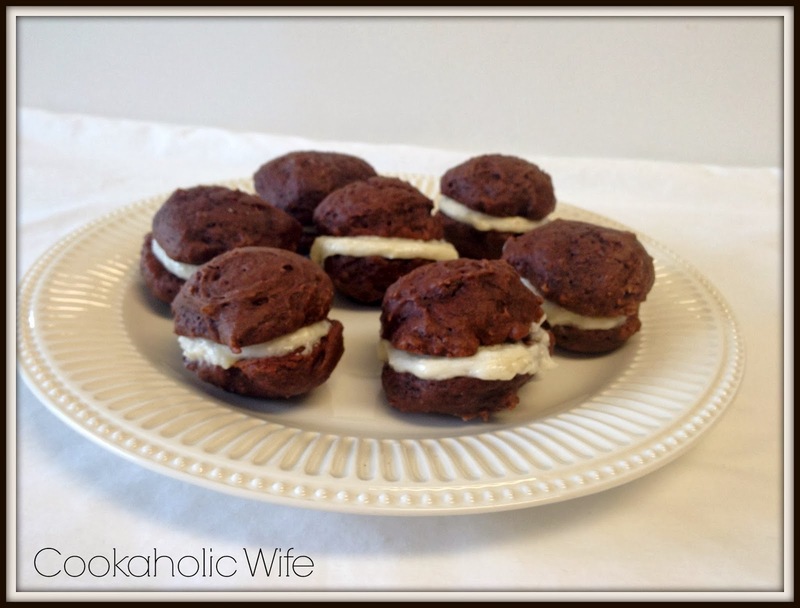 Gobs is such a fun way to refer to whoopie pies. They are gobs of fun to eat!! This is the best way to eat cake and frosting: it's portable and you don't make much mess because there are two pieces of cake!! Gobs, whoopie pies, whatever the name, a chocolate – vanilla frosting sandwich is classic comfort. And deliciousness! Love the name gobs! Maybe it came from our British term for mouth? Since you can easily shut your gib with a few of these! Yummy!